Omnia is the answer for those who want to produce various pasta shapes with a small footprint: short pasta like maccheroni or long pasta like spaghetti, or even special pasta, like paccheri or candele as well as nests and lasagna. Compact and versatile, this machine takes up the space of a very small production line. It is characterised by Premix Plus, Storci’s worldwide patented pre-kneading system that can produce large quantities of dough with low energy costs and high quality results, and all this without operator. The patented double head is the only one in the world able to produce both short and long pasta as well as special shapes. A device diverts the dough from one head to the other one, with no wastes and without filling with the dough the head that is not being used. The picture shows the conical core as alternative to the double head. 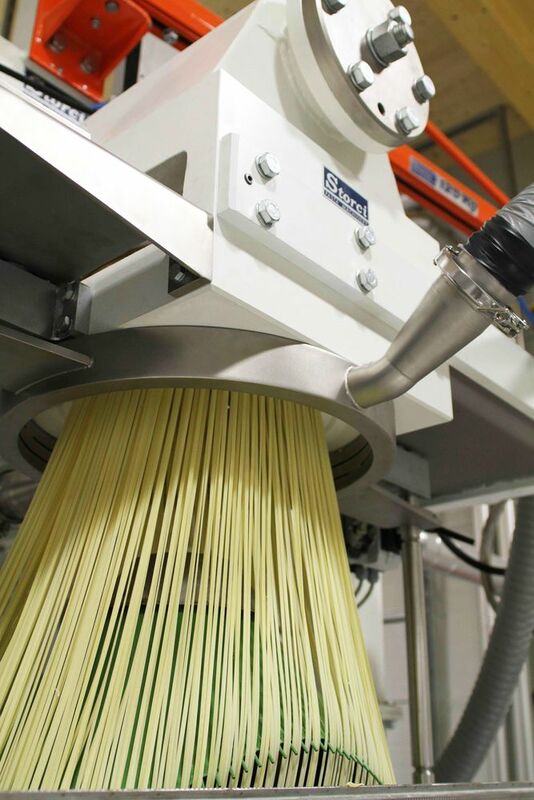 The pre-dryer Omnidryer, thanks to its peculiar internal structure, can divert air flows and adapt them to the shape of pasta. The variable internal structure, can pre-dry both long, short and special pasta shapes, with no changes to the line. For the management of trays or racks, the line can be automated with a stacking-destacking unit or with the automatic OmniRobo system, which simplifies the work with limited use of personnel.